After publishing the very successful article regarding origins of the “kolovrat” symbol, I was requested to write a similar article about a symbol, which came to be known as “vegvísir” (literally “The pointer of the way”, “Wayfinder”) among those interested in Norse mythology. In this case, the situation is much simpler in comparison to other symbols. In the following article, we will take a look at various nowadays interpretations of the symbol, as well as its true origin. 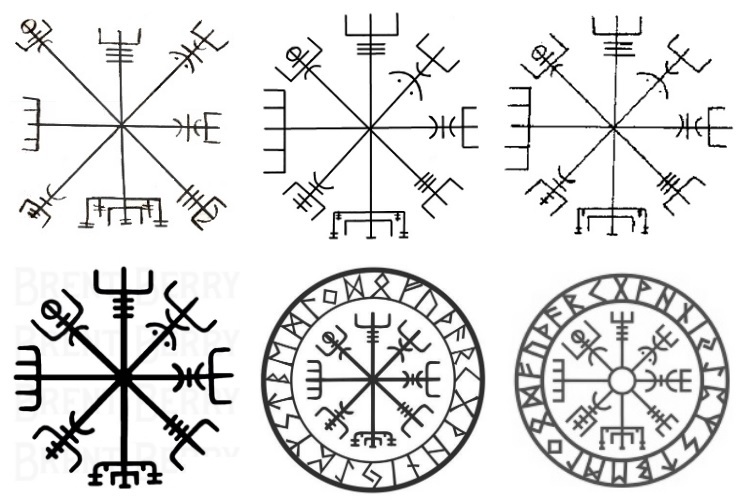 Development of depictions of the “vegvísir” from 19th century till today. Source: Foster 2013 – 2015. Nowadays, “vegvísir” is famous among neo-pagans, musicians, reenactors and especially fans of TV series and other mass-production revolving around the Viking Age. We cannot omit its use in clothing industry, also often seen as a jewellery or tattoo. Reenactors tend to use it as shield decoration or costume embroidery. 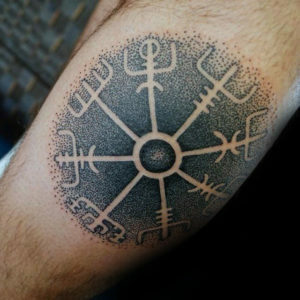 Among this inconsistent group of people, it is often accepted for “vegvísir” to be “a Germanic and Viking ancient magical rune symbol, which function was that of a compass and was supposed to protect the Viking warriors during seafaring, providing guidance and protection from Gods”. Such an interpretation can only be found in popular literature though, and in romantic fiction created in the past 30 years. Among other very similar symbols which can be found in the Huld manuscript belong to the “Solomon’s sigil” (Salómons Insigli; nr. XXI) and “Sign against a thief” (Þjófastafur; nr. 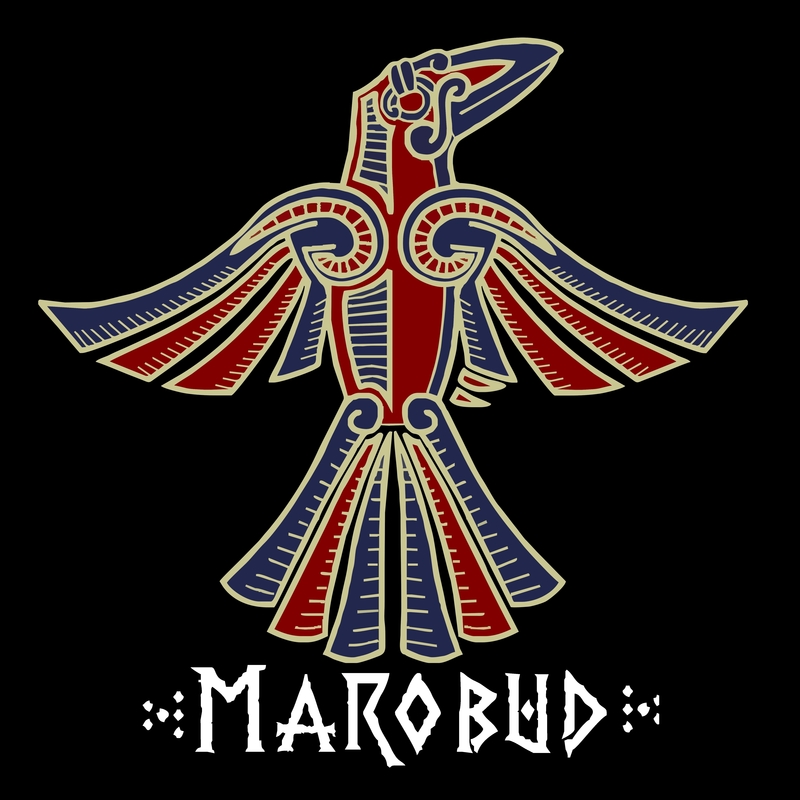 XXVIII). Symbols from manuscripts ÍB 383 4to (27r), Lbs 2917 a 4to (27), Lbs 4627 8vo 17v). Along with other symbols, the “vegvísir” came to Iceland most likely from England, where star-shaped symbols can be tracked as early as 15th century, such as “The Solomon’s testament” (Harley MS 5596, 31r). The original symbols had their meaning in Christian mysticism. A more thorough research might confirm the use of sigil magic even in earlier periods. The first literature containing the Icelandic version of “vegvísir” symbol along with translation to German was most likely an article by Ólaf Davíðsson on Icelandic magical marks and books from 1903 (Davíðsson 1903: 278, Pl. V). The second time the symbol appeared in literature was in 1940 with Eggertson’s book about magic (Eggertson 1940: column 49; Eggertson 2015: 126). It is often incorrectly believed that “vegvísir” is also depicted in “The Book of spells” (Galdrabók). This mystification appeared at the end of 1980s, when Stephen Flowers publicised his paper The Galdrabók: An Icelandic Grimoire, in which the “vegvísir” does indeed appear (on page 88), but only in a side note on Icelandic grimoires. So how comes the symbol is so popular these days? We believe the author Stephen Flowers played the main part in propagation of the symbol, thanks to the intense promotion of his paper during the beginning era of the Internet. That was in times of growing interest in Old Norse culture and emerging re-enactment community. Those interested in the topic, arguably due to lack of better resources than on purpose, based their research on the best available book with symbols that had a certain feel of authenticity due to being based on Icelandic origin. With its increasing popularity, the “vegvísir” also became an attractive article for online shops targeting this particular market, as well as for Icelandic tourist shops (see Tourism on Iceland), which still promote the “vegvísir” as an “authentic Viking symbol” due to commercial reasons. Another notable promoter of the symbol was the Icelandic singer Björk, who had it tattooed in 1982 and began to describe it as “an ancient Viking symbol, which seafarers painted with coal on their foreheads to find the correct way” since 1990s (gudmundsdottirbjork.blogspot.com). This caused “vegvísir” to become a part of tattoo artists’s portfolios, and at the moment the two mentioned influences intersected, the symbol became one of the most often tattooed motives in the neo-pagan, musical, re-enactment and Old Norse interest communities. It is important to note that nowadays the circular variants, sometimes accompanied by rune alphabet, are the most used, although the original versions were of squarish shape and are without any runes. The symbol known as “vegvísir” is Icelandic folk feature borrowed from continental occult magic “Solomon’s testament”. It is about 160 years old and its use is limited to the 2nd half of 19th century in an Icelandic city of Akureyri. The only literary sources we have from the Icelandic tradition are few mentions in three manuscripts, which are based on each other. The “vegvísir” is not a symbol used or originating in the Viking Age, and due to the 800 years gap should not be connected to it. The original Icelandic “vegvísir” is of square shape, with the circular variants emerging in the 20th century. Its current popularity is tied to the spread of the Internet and strong promotion in an on-line medium, that is easily accessible by the current users of the symbol. I would love to express my thanks to my friends who inspired me towards composing this article, as well as those who provided me with the much-needed advice. My gratitude goes to Václav Maňha for the initial idea, to Marianne Guckelsberger for corrections on the Icelandic text and to René Dieken for providing me with various English sources. Davíðsson, Ólafur (1903). Isländische Zauberzeichen und Zauberbücher. In: Zeitschrift des Vereins für Volkskunde 13, p. 150-167, 267-279, pls. III-VIII. Eggertson, Jochum M. (1940). Galdraskræða Skugga, Reykjavík : Jólagjöfin. Eggertsson, Jochum M. (2015). Sorcerer’s Screed : The Icelandic Book of Magic Spells, Reykjavík : Lesstofan. Flowers, Stephen (1989). The Galdrabók: An Icelandic Grimoire, York Beach, Me. : S. Weiser.